There are 2 kind of deal sites in China. 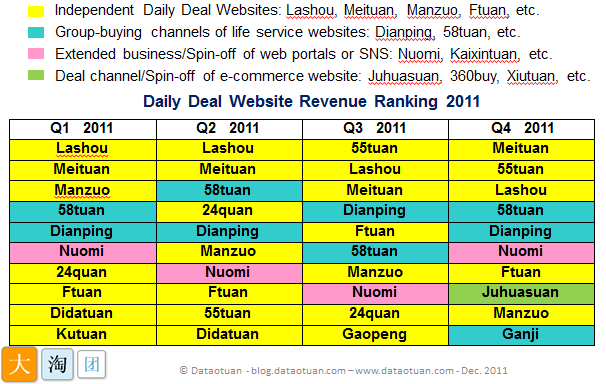 For now Independent websites, like Meituan are leading but it seems that affiliated deal sites like Nuomi are catching up. The big deal websites are diversifying into different business models to survive in this very competitive market. Some plan to become a sales channel, others an online shopping mall and you also have those that stay focused on local services deals. The whole year the number of deals kept increasing, almost as though this would be the solution for more sales. From Q1 to Q3 though the average Nr. Sold kept dropping sharply. It seems to have stabilized in Q4. The quality of deals shows to be a more and more important factor for revenue. For the first time Dataotuan publishes insights about other Asian countries. See also our Asian Daily Deal Market infographic. 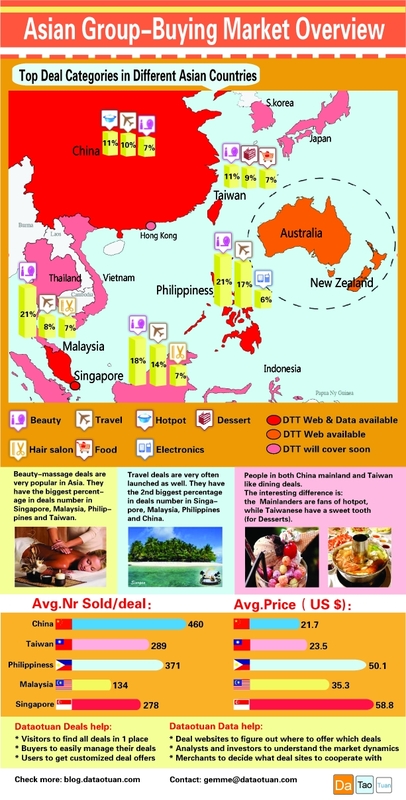 Beauty-massage deals are very popular in Asia. They have the biggest percentage in deals number in Singapore, Malaysia, Philippines and Taiwan. Travel deals are very often launched as well. They have the 2nd biggest percentage in deals number in Singapore, Malaysia, Philippines and China. People in both Mainland China and Taiwan like dining deals. The difference is the Mainlanders are fans of hotpot, while Taiwanese have a sweet tooth (for Desserts). China has the lowest average price ($21.7), but with the biggest Nr. Sold per deal (460). The average price per deal in Singapore, Philippines and Malaysia is much higher than in China and Taiwan. The reason might be the bigger percentage of Life services deals, which are more expensive than Dining deals. Singapore has the highest average price ($58.8). Malaysia the smallest Nr. Sold per deal (134). 2/ To analyze the deal data in order to help Daily Deal websites figuring out which deals to offer and where, to help analysts and investors understand the market dynamics, and to provide advice to merchants about which deal websites to cooperate with. Dataotuan aggregates and analyzes the daily deal markets in China, Singapore , Malaysia, The Philippines , Taiwan , Australia and New Zealand. See high res version on Asian Daily Deal Market infographic.